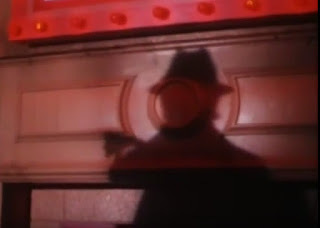 In the first episode of The Kolchak: the Nightstalker series (1974) Kolchak encounters Jack the Ripper, an immortal serial killer and the most famous un-named serial killing fiend in Western history. 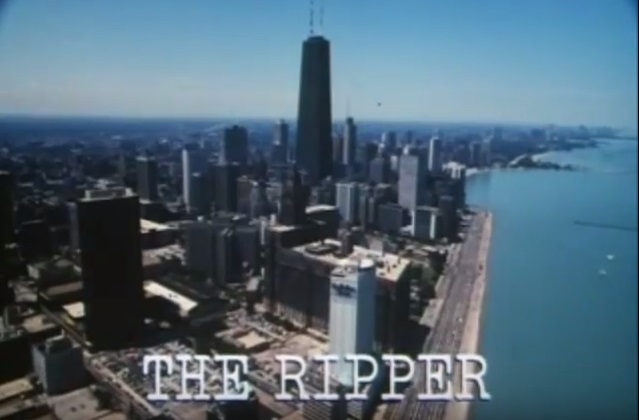 In Chicago women are being killed and mutilated, including victims in a go go dance club, a massage parlor, and a woman in an alley, in a manner eerily similar to the original 19th century Ripper killings in London.He also leaves writing in blood on the massage parlor mirror. Glimpses of the Ripper before he kills show Victorian attire, including a red lined opera cape, and cane with a gold devil-faced handle. Cornered by police in a violent rooftop shootout the Ripper shrugs off bullets, leaps off of a four-story building to the street, throws cops around like rag-dolls, leaps over a car, gets hit by a car going 30 mph, and flees into the darkness to escape. 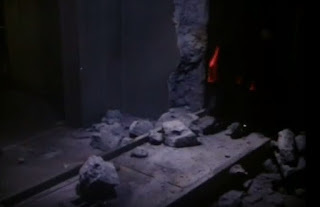 This happens again later in the episode at a construction site, with the Ripper leaping from girder to girder, after the cops try a sting with an undercover female masseur. This time the Ripper leaps up onto an electric fence and is rendered immobile. He is taken into police custody and put in a concrete and steel maximum security cell. However he recovers, knocks the door off the cell and escapes. 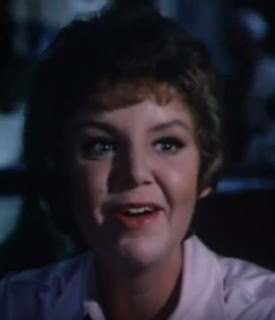 A colleague of Kolchak's, reporter Jane Plumm is interviewing potential Rippers as the usual quacks and crazies are coming out of the woodwork to claim responsibility. She gets a hit as she is sent a ripper letter describing things done to a victim the police withheld from the public and news. Added as a PS on the letter is a poem: Now a pretty girl will die, so Jack will have his kidney pie. This is in reference to the mutilation that the police hid; the kidneys were cut out. Jane is getting closer than she thinks as the Ripper is sending her poems, setting her up as a victim. The latest is: Jack is resting be reborn, to finish up on Wednesday morn. Kolchak recognizes this as the same poem as was written on the massage parlor mirror by the real Ripper. Jane however doesn't believe she is in danger and is eager to get the story. This leads her to her doom as she meets with the Ripper in Wilton Park. As Jane is missing Kolchak contacts her mother and finds a number of locations she was meeting her fake Rippers at. 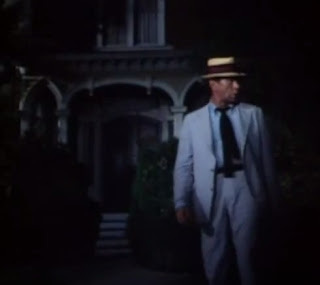 At the mention of Wilton Park Kolchak remembers a letter to the newspaper's advice column from an elderly lady complaining about her strange neighbor prowling around at night in a 'foolish costume' and 'x-ray eyes' in Wilton Park. This leads Kolchak to an interview with the elderly neighbor and the dilapidated house at the south end of the park and a confrontation with the Ripper. Remembering the incident with the electric fence Kochak rigs a trap with power cables from a water hole to the utility box on the Ripper's house. 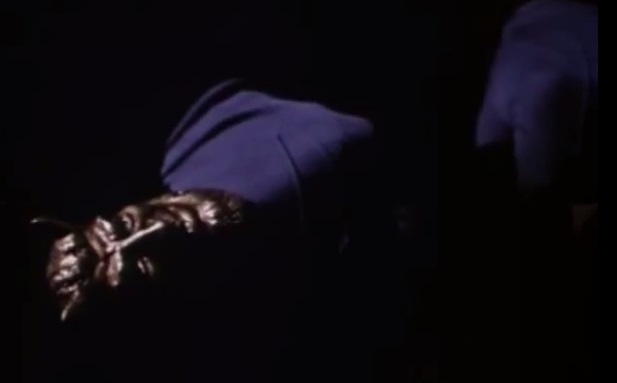 Kolchak breaks in and finds a number of antique items from the Ripper's decades. The Ripper returns and Kolchak hides in a closet. His nerve soon breaks and he flees downstairs, discovering Jane's body. Fleeing outside he connects the cable as the Ripper wades through the water hole after Kolchak. The Ripper is electrocuted and his fried body disintegrates in the water. The utility box overloads and catches fire and the house burns down with almost all of the evidence of the Ripper's existence. The only piece of evidence left to Kolchak is one of the Ripper's shoes salvaged from the fire: a shoe Kolchak has traced to a shoemaker in London who had discontinued the shoe type almost seventy years ago. 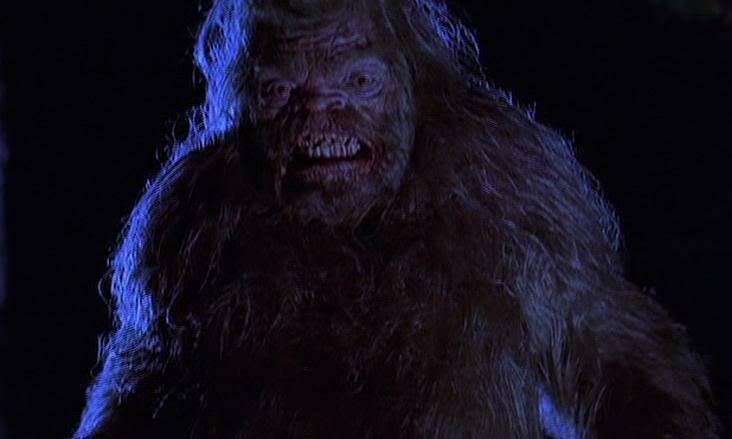 Facing charges of arson and malicious mischief Kolchak rips up his story as he laughs knowing no one would believe it. ⦁ 1d6 to unarmed and weapon damage from inhuman Strength. Two attacks per round. ⦁ 0 damage from normal weapons. He takes full damage from electricity, fire, or magic. ⦁ Immortal: The Ripper can only be permanently killed by electricity. ⦁ Regenerate 2 hp per round. ⦁ Springheel: The Ripper can leap over objects 10' high and up to 30' distant. Can make a controlled drop from up to 50' and take no damage. If it is an uncontrolled fall he can make a Saving Throw to take half damage from a fall. The Ripper never goes out of his house except at night as noted by Ms. Aginwiley, the nosy neighbor of the Ripper. With the aid of her telescope she also keeps a log of his comings and goings with dates and times coinciding with the new Ripper killings. He always appears in period Victorian dress and carries his devil-headed cane. He kills in a pattern. Five women, three individuals leading up to a final night of two victiims and then the Ripper moves on. What is the origin of the Ripper's condition? It is never explained although Kolchak, in conversations with Jane Plumm and a tirade to Police Captain Warren, gives details of his investigations of the Ripper's past. Kolchak believes that each ripper described is the same man, Jack the Ripper, the current Chicago Ripper. ⦁ Many instances of rippers have cropped up worldwide over the decades. ⦁ Jane describes a ripper that killed five flower girls in Italy. ⦁ In 1908 a rIpper identified as Eugene Lang was caught in New York but escaped in a frenzy. Kolchak believes his frenzied escape was due to the use of the electric chair. He feared itnand knew it would end him. ⦁ Five women were killed in Paris in the summer of 1888. ⦁ On August 14, 1904 a crack Athenian firing squad tried to execute the RIpper three times and failed. Perhaps the RIpper is cursed, partakes in the ritual murders of five women to attain immortality, has made a deal with the Devil, or some other explanation to gain his abilities. Tsukimono is the possession of a body by a yokai or animal spirit. This is always involuntary as no invitation is given. The possession is forced upon the host body, often those who are weak of will, sick, or evil. These spirits invade the flesh and twist it into a parody of the host body combined with the spirit's animal type. Given the joy of flesh they will often not be able to contain themselves and will glut themselves on drink, meat, blood, and violence. They are unnatural and must be hunted down and exorcised or destroyed for the sake of the areas they are terrorizing. As presented here they are a template with features added onto the possessed character's level or NPC hit dice. While oriental in flavor they could easily be used for any horror game, fantasy to modern. ⦁ They retain all of the abilities and statistics of the host body but gain extra hit points and can regenerate damage due to their otherworldly origins. They retain the memories of the host body and may use that to their advantage. ⦁ They only take half damage from weapons which are not blessed (the spell), holy, magic, or with fire which will purify their flesh. ⦁ As a spirit or yokai they can be turned as if undead. They can also be barred from entering a dwelling if a talisman is placed upon the entryways. The possessing spirit must make a Saving Throw with a four penalty to enter. Here are a few examples of a possessing animal spirit. The fly and spider possessed are a hideous sight. Twisted human forms with exoskeletons, legs, wings, etc bursting forth from and melding with the human flesh. They are terrifying to behold. A greasy exoskeleton, hairy legs, compound eyes, gigantic wings, and a drooling sucking mouth. ⦁ +2 hit points per level/hit dice. ⦁ Acid Vomit: Every third round the fly possessed can vomit stomach acid as a 10' ranged touch attack (no armor bonus.) 2d6 damage the first round, 1d6 the second round, Save for half. ⦁ Detect Carrion: 1-4/1d6, 100' radius. ⦁ Regeneration: 1 hit point per round. ⦁ Wall Walker: they're flies, they walk on walls and ceilings. 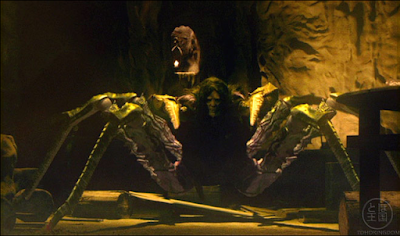 A hairy exoskeleton, large spider legs, mutiple spider eyes, and huge mandible dripping with venom. ⦁ +3 hit points per level/hit dice. ⦁ Claws: The large spider legs can slash twice per round for 1d4 damage per claw. If both hit the spider possessed automatically rips the victim for an extra 1d6 damage. 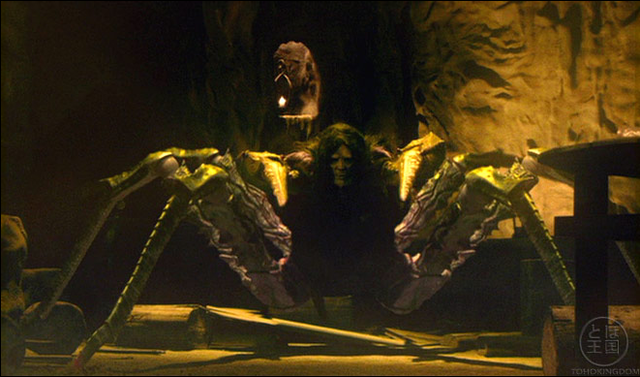 ⦁ Bite: In lieu of the claw attacks the spider possessed can attack with its large mandibles. If the attack hits it does 1d6 damage and the victim is injected with a paralytic venom. He must make a Saving Throw or be paralyzed for 1d4 turns. ⦁ Regeneration: 2 hit points per round. ⦁ Web: As per the spell. Can be used once per five rounds. Unlike the fly and spider, the shark and squid possessed are not masses of torn flesh and hideous parts. With shark and squid animal smoothly melds with man creating a new humanoid form. Although they prefer water each can operate on land. Their regenerative powers will protect them from dehydrating away from the waters. Large humanoid form with shark fin, webbed hands and feet, rough hide, black shark eyes, and a mouth full of rows of razor sharp teeth. ⦁ + 4 hit points per level/hit dice. ⦁ Amphibious: The shark possessed is as comfortable in water as it is on land. It can breathe under water and swim at a rate of 180'/60'. ⦁ Cold Immunity: Take one half damage, no damage when a Saving Throw is required and successful. ⦁ Bite: The powerful bite of the shark possessed does 1d8 damaged. If the attack is successful by five or more points the shark possessed clamps onto and begins to violently shake the victim doing an extra 1d8 that round. Each round after the victim will take an automatic 2d8 per round from bite/shake damage unless he makes a Strength check with a four penalty due to the shark possessed's jaw strength. ⦁ Blood Scent: When a creature is bleeding the shark possessed has a chance to sense it. In the water the chance is 50 percent plus 5 percent per level/hit dice with a maximum of 100. The range of this is 100' per level/hit dice. This chance is halved land and the range is 30' per level/hit dice. ⦁ Regeneration: 3 hit points per round. 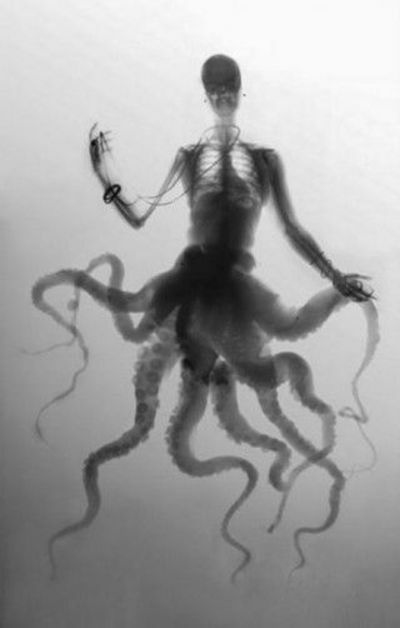 Arms and legs become tentacles and four new ones emerge from the torso, the skin is rubbery and slick, and a squid's beak forms beneath black eyes. ⦁ Amphibious: The squid possessed is as comfortable in water as on land. It can breathe under water and swim at a rate of 180'/60'. ⦁ Ink Spray: Three times per day the squid possessed can release a jet of ink. If on land it can target one creature within 10' with a ranged touch attack (no armor bonus.) If successful the creature must make a Saving Throw or be blinded for 1d6 rounds. If released in the water it gives those within the cloud a -4 to hit penalty in the murky water. ⦁ Tentacles and Bite: The squid possessed attacks with four tentacles per round doing 1d3 damage per hit. If two or more hit the same foe in a round the target is automatically entangled and slowly crushed for 1d4 automatic damage per round and is dragged towards the squid possessed's beak for an extra attack (not automatic) doing 1d6 damage. The victim can break free with a strength check with a -1 penalty per tentacle attached. Until he does so he is subject to the automatic crushing damage and the extra beak attack. The Destroyer Demon is a rare possessing spirit that is not an animal spirit. It is the manifestation of nature's rage, hate, cruelty, and vengeance thrust into a human shell. The possessed body transforms into a large shaggy white-haired beast with red eyes and large iron teeth. Unlike possessing animal spirits the destroyer yokai will use man-made weapons. They are deadly foes given to murderous rage and debauchery against any living foe they encounter or stalk. The white fur is often stained with gore and offal of victims. While intelligent they often lose themselves to their rage and act as beasts. They usually feast on the corpses of their victims. ⦁ +5 hit points per level/hit dice. ⦁ +4 bonus damage to strength and strength checks. The Destroyer is a physically powerful beserk thing filled with a terrible rage. This bonus damage is in additon to any normal strength bonus the character had. It applies to the Destoyer's bite or to weapon damage. ⦁ Beserk: The Destroyer gains an extra attack and a +2 bonus to hit in combat. ⦁ Bite: The Destroyer can bite with its iron teeth for 1d6 plus strength bonus + bonus damage. It prefers to use man-made weapons especially large weapons such as the naginata or tetsubo. ⦁ Regeneration: 4 hit points per round. ⦁ Track by Scent: The Destroyer has a base chance of 50 percent plus 5 percent per level/hit dice with a maximum of 100. This roll can be modified by weather and other conditions. This is also the percentage that the Destroyer avoids surprise if it is rolled against him. 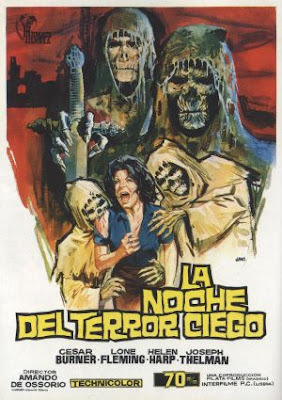 Another quickie using OA with western horror themes, this time a homage to the Blind Dead series of 70's horror films. Years ago in a small castle town a group of samurai betrayed and murdered their young lord in an attempted coup of the clan. They were defeated and the vengeful clan elders blinded them and cast them into the abandoned mine shafts on the edge of town, sealing them in to starve and die a pififul, honor-less death. A shrine was erected at the sealed entrance to lock in their evil spirits should they attempt revenge on the clan and the town. Time passed and the clan was abolished by the shogunate, the castle torn down, and the town lost its prestige and prosperity. An earthquake shook the town last night. Many were killed in the collapsing buildings and an old nearly forgotten shrine on edge of town fell down, its holy seal broken, and half buried in a long forgotten pit now cracked open. As the living help to rescue those trapped in the rubble evil awakens below and the blind dead will craw forth and take their revenge on the living! Number Appearing: 23 or as many as the DM wishes. The blind dead are undead corpses reanimated for their desire for revenge on all of the living. They will attempt to kill any living thing in their path. They are withered and nearly mummified from their time locked in the tunnels below the town. Each is dressed in the rotting and ragged clothing of a samurai and their eyes are empty pits long ago burned out. They will fight with their clawing hands or biting mouths untill they obtain a weapon, preferably a katana or yari lance. The blind dead are undead and have all of the normal traits of an undead. They are turned normally and are damaged by holy items or talismans. If they encounter a holy item or talisman they must make a Saving Throw with a 4 penalty or retreat from it. They do not have darkvision but can sense the living breath of creatures within 30' of their position. If a living creature holds his breath he is effectively invisible to the blind dead. If he does not the blind dead cannot be surprised and the living creature cannot hide from it while within the 30' radius. All missile attacks by the blind dead are made at a -4 penalty ontop of any other penalty. Their state of death has diminished their samurai fighting abilities but it has also given them other advantages gained from crawling around in their charnal pit. They are stealthy and are skilled at skulking in the shadows. They can move silently at a 65 percent chance and can hide in shadow at a 55 percent chance. They are intelligent and will use these abilities to attempt to backstab a victim for x2 damage if they are out numbered. If the blind dead do have the numbers advantage they will likely charge in and attack, only retreating if losing a number of their horde or if repulsed by holy items and talismans. The blind dead cannot abide the light of day. They must hide from the sun and direct sunlight will burn them for 1d8 hp damage per round. Any activity taken while the sun is up costs them a -4 penalty, even if they are hidden away deep underground. The blind dead, once dropped to 0 hit points are destroyed. Their greatest advantage is in numbers. They will emerge from their broken pit, crawling up through the half sunken shrine, and attack any living they discover. This is an opportunity for a survival horror scenario as they will hide among the rubble, picking off survivors until weeded out like roaches. Pick a mine map, drop a busted shrine on it, put it under a decent sized and half wrecked fishing village and viola. Continuing with both the Oriental and Halloween themes I decided to mix up a bit of East and West based on, of course the Headless Horseman. The Headless Samurai is a vengeful spirit, eternally tortured to search for his head and those who betrayed him in life many many years ago. Tragedy, betrayal, vengeance. All the good stuff. Attacks: Flaming katana (1d10+1d6 fire) or flaming yari/lance (1d10+1d6 fire). Two attacks per round. The headless samurai is the vengeful spirit of a disgraced samurai forced to commit seppuku. The samurai's lord betrayed his loyal retainer, framing him for theft of a clan relic, and forcing the ritual suicide so that the lord might take the samurai's wife as a concubine. The samurai's body was not buried with the proper rituals and was thrown into a nameless grave. His head was taken as a trophy by a rival samurai. Soon after the vengeful spirit manifested on the nearby roads on a darlk fiery steed and began to kill any it encountered at night seeking its head and the lord who betrayed it in life. Those decapitated often accompanied the samurai on its midnight rides as flying heads trailing in his fiery horses wake. Locals and travellers avoided the cursed road and nearby forest. 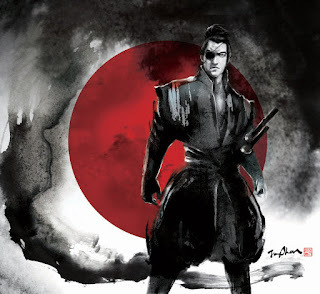 The lord grew old and died and the samurai's head was lost to legend over the years. Denied its revenge the headless samurai still haunts the area on many dark nights with its fiery steed and floating, biting heads. 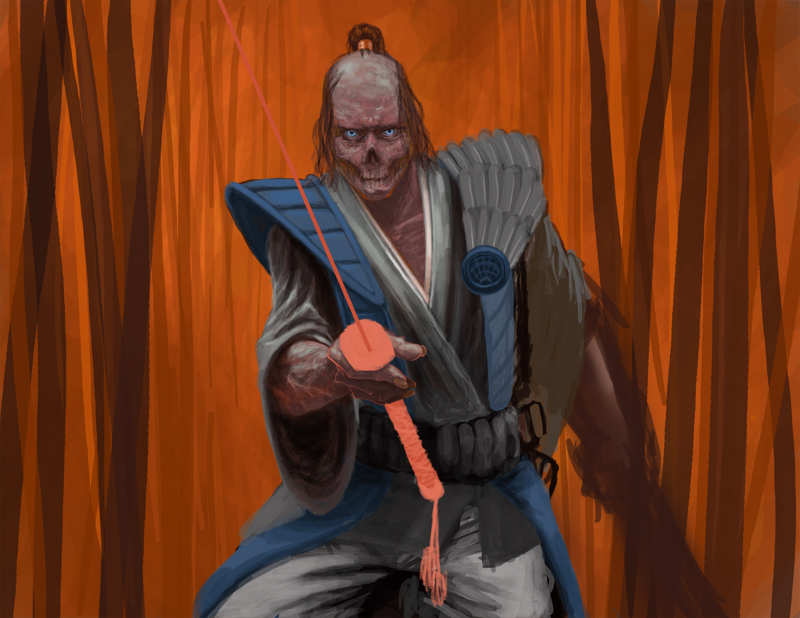 The headless samurai is a physical ghost which manifests on certain nights immediatly after sundown near its hidden grave in the forest. It rides a nightmare which manifests nearby as well. The two begin to ride the roads near the forest and are joined by 1d6+6 flying undead heads of past victims. 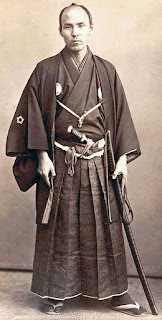 The samurai cannot abide the light of day and will fade into non-existence 1d6 rounds after sunrise, as do his companions. If dropped to 0 hit points it will fade away only to return on the next night it manifests. 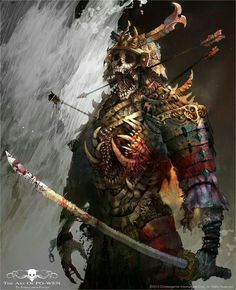 The samurai is undead and has all of the normal traits. It can only be hit with silver, magic, or holy items/weapons. It is immune to fire. It can regenerate 3 hp/round until dropped to 0 hit points and fades away. It has darkvision at a range of 60'. The samurai can attack twice per round with either its katana or yari, both aflame with the fires of Hell. On a natural roll of 20 the victim must make a Saving Throw or be beheaded in combat. Three times per night it can project hellfire from its weapons or hands in a 60' stream. It is a ranged touched attack (do not count armor on AC) and if the samurai hits it does 3d6 damage the first round, 2d6, the second, and 1d6 the third. The victim may Save for half damage. This is the only attack allowed in the rounds it is used. Its primary strategy is to charge in with the nightmare and the flying heads to do as much damage as possbile with its yari. It will then dismount and fight the strongest looking foe as the nightmare and heads attack the foes allies. All slain will be decapitated and the heads taken. The samurai can only be laid to rest by achieving the following conditions. They are a great opportunity to run an investigative game if the DM is so inclined. Find its lost head. It was stolen decades ago although it is known by some older clan retainers which rival samurai stole it from the grave. Place a name marker over the headless samurai's hidden grave and perform proper burial rituals. 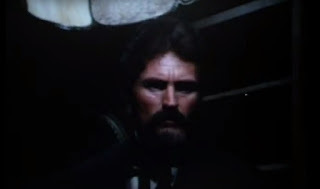 The oldest living male descendant of the lord who betrayed him must formally apologize to his spirit at the grave-site. 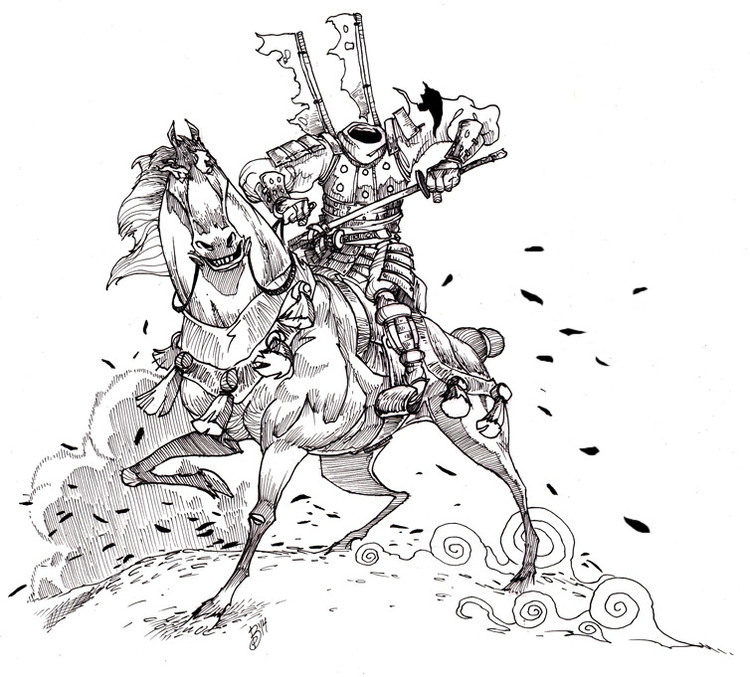 The headless samurai is accompanied by a Nightmare as its steed (use stats of system of choice, minus flight and ethereal abilities) and the flying heads of its victims. Attacks: Bite (1d3) and swarm bonuses to hit. Move: As fast as the nightmare. The heads are the remains of past victims decapitated on the roads and in the forest. 1d6+6 will manifest nightly and fly along to join the samurai on its ride wailing and gibbering. They are pale shriveled things with dark eyes and blood stained teeth. They have all the normal undead qualities including vulnerability to holy items and being turned as zombies. If a head is dropped to 0 or less hit points it explodes into dust. 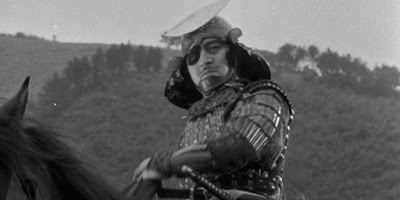 It will reform on the next night it joins the samurai on the hunt. Here are three religious classes for Oriental themed games. 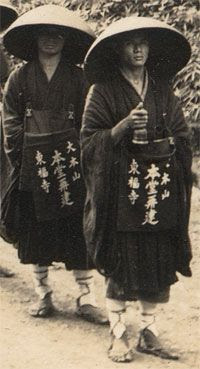 The familiar Sohei and Yamabushi/Shukenja and a not quite fluffed out Priest. I have seen many interpretations of these: OAD&D, Bushido, L5R/d20, and various retro-clones and releases alternate classes in pdf and on blogs, etc. Here are mine. I wanted something more in line with the historical descriptions of these two types of warrior-monks and warrior-priests with the slightly magical D&Dish influence of the Cleric role. We'll get to the Priest after that. Buddhist warrior-monks, trained temple guardians, more fighter than cleric. They are primarily trained in combat, can use any weapon and wear any armor, and slowly gain a few clerical spells. They are bound to the temple they serve and their masters will send them on various missions to serve the temple's interests. 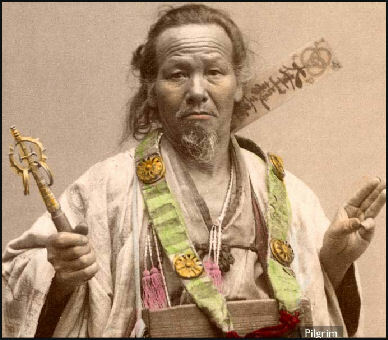 A Sohei must be of Lawful alignment but they can be Good, Neutral, or Evil depending on their temple's alignment and masters they serve. 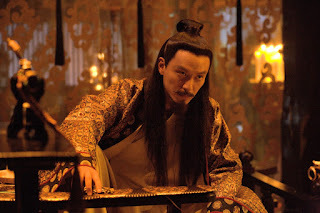 The Sohei does have a few basic religious restrictions such as not eating meat (fish is allowed) and moderation of his behavior in gambling and drinking, but it is allowed. Over indulgence is frowned upon. As a soldier of his temple and faith he may use violence and kill his enemy in battle but murder and assassination are forbidden. ⦁ Spells: As Cleric. Gains first spell at level three. Gains a new spell level at levels 3, 6, 9, 12, etc. 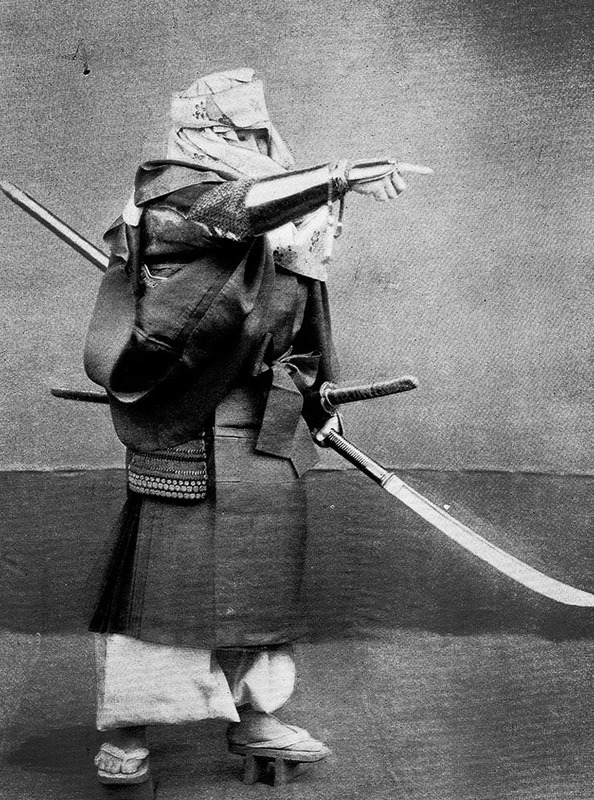 ⦁ Unarmed Combat: The Sohei is trained to fight bare-handed as well as armed. At first level the unarmed damage is 1d3, at fifth level it rises to 1d4, and at twelfth level it rises to 1d6. ⦁ AC Bonus: The Sohei is trained to protect himself when unarmored. When he has no armor bonus from equipment he adds a +1 to AC at level one, +2 at level five, and +3 at level twelve. ⦁ Favored Weapon: The Sohei may choose any one weapon type such as Naginata (pole-arm) and receive a +1 to hit with that weapon type as well as increase the weapon's damage by one dice step. ⦁ Religious Fervor: Once per day per two levels (round up) the Sohei can call upon his fanatic zeal and dedication to his duty to increase his damage in battle. The attack is at a -2 to the attack roll but does x2 damage if successful, x3 if a natural 20 is rolled. A wandering warrior-priest devoted to the service of others he is a practitioner of the religion of Shugendo, they are also known as Shukenja. Yamabushi must always be of Lawful (Good) alignment. They are mountain mystics studying religion, mystical texts, and the arts of war. They are similar to Sohei but are less combat orientated and are free to wander as they please, often performing ceremonies such as marriages and funerals for the often isolated mountain folk. The Yamabushi are mostly solitary but will form alliances with Buddhist or Shinto temples to serve the people. 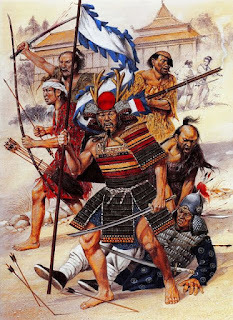 They would also participate in defending a temple or in major battles with Sohei and Samurai. 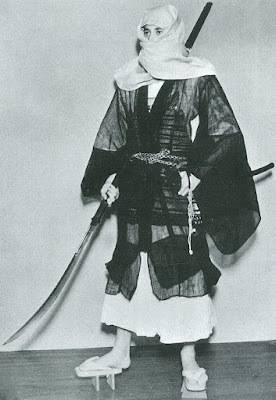 The Yamabushi has a number of religious restrictions: he cannot eat meat, he must show moderation in eating and drinking, he must refrain from violence when possible, and must not kill outside of war or in defense. They sever all connections to family and social status when becoming a Yamabushi and is expected to donate excess wealth to charity and live a life of poverty. ⦁ Spells: As Cleric. Gains first spell at level two. Gains a new spell level at even levels thereafter. ⦁ Turn Undead: As Cleric. ⦁ Favored Weapon: The Yamabushi may choose any one weapon type such as Naginata (polearm) and receive a +1 to hit with that weapon type as well as increase the weapon's damage by one dice step. ⦁ Create Talisman: Creates a temporary holy item in the form of writings and drawings on paper. The Yamabushi can create one talisman per day per level. The item's power lasts for a number of days equal to the Yamabushi's level. ⦁ Spirit Strike: The Yamabushi as the ability to strike undead, spirits, and creatures that require silver or a magic weapon to hit. This ability does not add a bonus to hit or damage but only confers the ability to hit and damage the foe with an otherwise ordinary weapon. At level one he can hit foes requiring silver to hit. At level four +1 weapons. At level eight +2. At level twelve +3. IF your game goes beyond these levels : At level sixteen +4. At level twenty +5. And then we get to the Priest. I'm stuck at the moment. I confess I do not enjoy religion in gaming. In my normal Old School D&D I tend to hand wave deities for clerics. The players probably know more about the evil humanoid gods than their own. I'm just not into that. So....... I need to do a bit more research on Buddhism, Taoism, Shintoism etc to round out this class with restrictions, etc. I really don't need to but if I'm going to to this class I feel I have too even if it's just a few fluff paragraphs. For now: here's a generic priestly class orientated towards ceremonies and little bloodshed. Add in restrictions such as vegetarian, cannot kill, no wealth, etc for now. Weapons: Bo, jo, sling, and any other blunt weapon which will not likely spill blood or kill. ⦁ Spells: As many per day as a Magic User but uses the Cleric Spell List. ⦁ Rituals: The Priest can cast spells via rituals and can attempt to cast spells of a higher level. The Priest may add his level to the casting roll. ⦁ Turn Undead/Spirits: As a Cleric. ⦁ Create Talisman: Creates a temporary holy item in the form of writings and drawings on paper. The Priest can create one talisman per day per level. The item's power lasts for a number of days equal to the Priest's level. ⦁ Languages: The Priest is educated in many languages and writing, often being utilized by the local lords as a translator or scribe when necessary. He begins with an bonus language at first level and gains another at levels 4, 8, and 12. 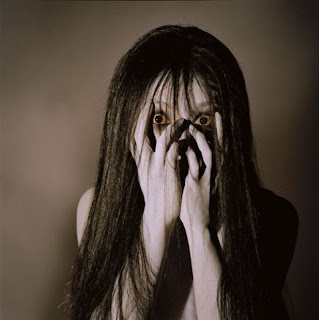 The Onryo is the ghost of a person who has died a tragic death full of powerful passions: jealousy, rage, hatred. Their souls are unable to rest and return from the shadows seeking revenge on the living. Its pitiful state causes the ghost to vent its fury on any that come across it. It makes no distinctions on who it destroys; all living men, women, and children are its victims and subject to its unholy wrath. 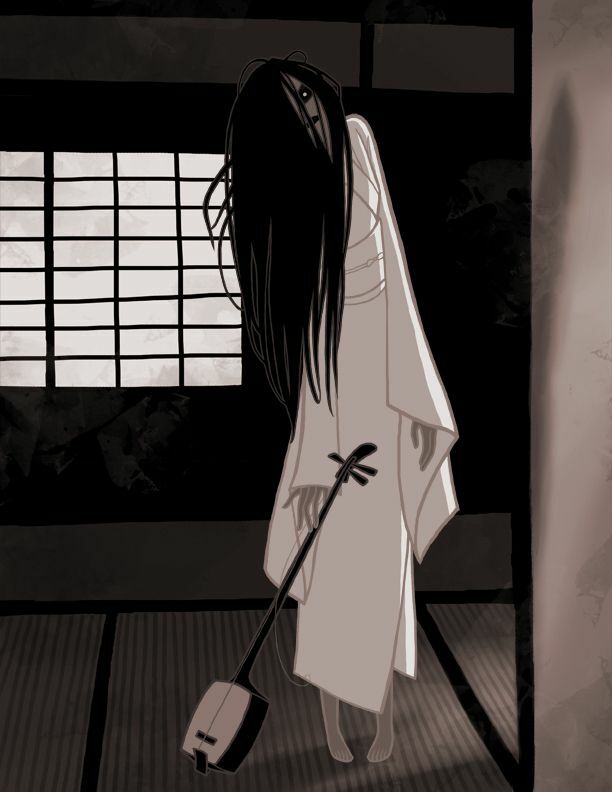 The Onryo may also toy with it victim, savoring the fear, confusion, and anguish until it finally snuffs out their life. It is an engine of wrath, not mindless, but ruled by its evil passions, an absolute inhuman thing with no trace of humanity within its tortured form. 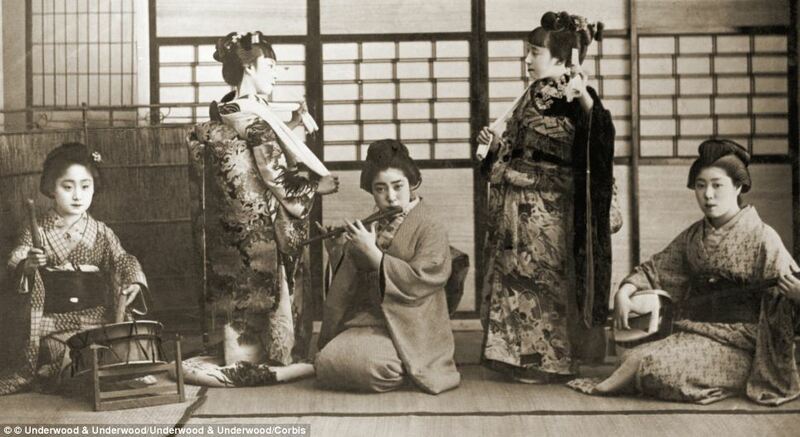 The Onryo will attach itself to a location or an object associated with its death. This place or thing will become shunned by those nearby and gain a reputation as being evil. Objects haunted by the ghost will usually be abandoned or locked away. The Onryo is a ghost with a physical form; not its original body but a pale dead imitation given to existence by its suffering and wrath. It lives in the realm of shadows and can enter our world through any dark shadow. It cannot abide the light of day. It appears as a pale corpse with black eyes full of madness and hate, and wearing either a white death shroud or ragged clothing like its corpse wore in death. Violent wounds or trauma inflicted before death will be evident. The Onryo is silent except for groans or death rattles. It's body may be contorted and move in strange ways. It can Spider-climb as per the spell. It has all the qualities of an undead creature. In combat it rips and tears at its victims with its undead strength, often tearing them to pieces. Its form is not subject to the laws of the physical world and it can only be harned by holy items and magic, ignoring all other damage. It can be turned and damaged with holy items as any other undead, although it cannot be destroyed by either. The Onryo enters our world and moves freely through the shadows. Any shadow large enough for the ghost to crawl through will serve. It has the ability to sense any useable shadow in the presence of its victim and will often attack from the closest shadow (such as appearing in the darkenss of her victims bed covers... see the Grudge.) To move through a shadow is a free action, the Onryo simply enters into it and instantly emerge from a shadow near the victim, a shadow in its lair, or any other shadow at a location it knows. It can also choose to stay in the shadow realm between worlds. DM's may include a variation on this. For example in the Ring the vengeful ghost psychic Sadako uses her abilities to curse a video tape and can emerge from a television to kill a victim unless a ritual (in this case making a copy and having someone else watch the tape) is performed by a victim to avoid their fate. In a fantasy setting a mirror could be cursed and the ghost could emerge from it to kill. Mix it up. The curse surrounding an Onryo is incredibly powerful. Those who visit the place haunted by or handle an object tied to the Onryo may become infected with the curse unless they make a successful Saving Throw. The curse is potent enought that a penaty equal to the Oryo's hit dice is applied to the Saving Throw. Those afflicted must suffer as the grudge-curse attaches itself and blackens their lives, perhaps even catching the attention of the Onryo itself. Those who actually witness the of the Onryo itself and survives are subject to attacks by the Onryo. Once seen it will hound the victim nightly. The true isidiousness of the grudge-curse will become apparent as the influence of the curse may seep out beyond the initial victim, infecting loved ones, friends, and confidants close to the victim. If a cursed victim speaks of the affliction, discusses the Onryo's haunted place/object, or describes the sight of the Onryo itself they may extend the curse to the person they are confiding in. The listener must make a Saving Throw (no penalty) or become cursed as well. Remove Curse spell. Both conditions must be met. Even if the Onryo is destroyed the site/object will continue to be a source of the grudge-curse. Roll on the chart below, re-roll all 1's if the Onryo has been destroyed. This will continue nightly until the curse is lifted or the victim is killed. In rare cases, at the DM's discretion, those killed may return as an Onryo themselves. Each night the victim must make a Saving Throw with a penalty equal to the Onryo's hit dice. Each fail costs the victim one point of Constitution and Charisma as the victim withers and sickens with disease and decay. No natural or magical healng can bring this back until the curse is lifted. You are consumed with severe depression. Every day is a struggle to care enough to get yourself together and face the world. All actions are at a -2/10 percent. If you are prescribed medication this drops to a -1. Any roll of the dice at maximum failure ( 1 on a 20, etc) will increase the penalty to -4-/20 percent until a good nights rest is taken. The victim feels a heavy weight on his shoulders and catches glimpses of the ghost out of the corners of his vision, and a feeling of someone always watching. Sleeping difficult and all actions are at a -2/10 percent penalty even with rest. Recovering spells is difficult with the sleep issues. On a roll of 1-2 on a 1d6 the victim did not rest sufficiently that evening to recover spells. You self medicate yourself in order to deal with daily existence. To get through the day you must have at least a bottle of drink or a hit of drugs to keep yourself going. If you do not have your daily fix all actions are at -2/10 percent. When you do have your 'medication' you are only at a -1 penalty. You must do certain things each day. Compulsions can include such things as having to wash your hands, check your weapons, etc. The DM can call for these randomly (at least one per play session) and you must make a Saving Throw to avoid doing your little ritual. If you must do it immediately or take a -2/10 percent penalty to actions until the ritual is completed. If you fail by 10 or more (or roll a natural 1) you are so distracted by your compulsion you take a -4-/20 percent to actions until the ritual is fulfilled. Kleptomania falls under compulsion but works differently. If you fail your Saving Throw you must acquire the object of your desire. You will be at a -2 to actions until you steal it. If you fail by 10 or more (or roll a natural 1) you must have it NOW and will take it despite any consequences. Particularly dark DM's can come up with more sinister compulsions such as cannibalism or necrophilia. Such particularly debilitating compulsions may call for a weekly roll instead of a daily roll given the severe social and legal consequences associated with such behavior. When under stress you must make a Saving Throw or a darker piece of your psyche emerges. You are more aggressive and every time you are irritated or challenged you must make a Saving Throw or become violent towards the object of your irritation. This lasts for 2d6+4 rounds. Once it ends you come to your senses, even if still in a fight. You will not manifest this again for 1d6 hours. You gain a +1 bonus to melee/unarmed damage while in this state. You believe things that are odd and, frankly, not real. Hallucinations are not uncommon. The DM will describe these things as if they are fact to your character. If challenged to the reality of what you believe you must make a Saving Throw. If you fail you refuse to believe what you are told and cling to your reality. If you fail by 5 or more you will be become irrational and refuse to listen. If you fail by 10 or more (or roll a natural 1) you will become physically violent for 2d6+4 rounds. Your madness builds into a murderous rage. If provoked or if you become angry you must make a Saving Throw (Paralysis) or fly into a rage and attack the source of your anger. This rage will last for 1d6 rounds. If you fail the save by 10 or more (or roll a natural 1) you will fly into a murderous maniacal rage with a +2 bonus to melee/unarmed damage until the target is dead or you are restrained. You cut, beat, or burn yourself. When you are stressed you must make a Saving Throw or be overwhelmed. To calm yourself you damage yourself doing superficial damage. However if you fail the save by 10 or more (or roll a natural 1) you go overboard and do 1d3 points of damage. Those that see you do this will probably be very upset by it. Especially strangers. You have an irrational fear of an object or situation. The DM will choose an appropriate one. When faced with the source of your fear you must make a Saving Throw. If you fail you take a -2/10 percent penalty to actions while in the presence of the fear. If you fail by 10 or more (or roll a natural 1) you are paralyzed, unable to act until the source of fear is removed. You have personality quirks. Severe ones. It can get so bad people become agitated by your presence. You may be paranoid, talk to yourself, wildly laugh inappropriately, constantly fidget, eat odd substances, mimic those around you, or other socially inappropriate behaviors. You may be afflicted with tics, stutters, strange gesturing, tremors, etc. You receive a -2 to Charisma for your quirk. You must make a Saving Throw each morning. If you fail your particular quirk is particularly bad today increasing your Charisma penalty to -4 for the day. You hear voices telling you things, arguing with you, taunting, or just giving bad advice. You suffer a -2 to Charisma. You must make a Saving Throw each morning. If you fail they are exceptionally loud and annoying today and you can't help but talk back to them, increasing your Charisma penalty to -4 for the day. If you fail by 10 or more (or roll a natural 1) you are constantly distracted by them and take a -2/10 percent penalty to actions. The victim is a vortex of bad luck and ill fortune. A darkness of the soul lingers on him. Any dice roll (players or DM) within 30' of the victim is at a -2/10 percent penalty. Others can sense the darkness around him and his Charisma is at a -4 penalty. This is left up to the DM to individualize his Onryo. Some may require that who ever wronged the is punished, others may require their bones be found and given a proper burial. Investigation, mundane and magical, into the nature of the grudge-curse can lead to an interesting game with PC's racing against the clock to stop their afflictions and save their loved ones. "The spider spinning his web for the unwary fly. The blood is the life, Mr. Renfield." My favorite time of year is approaching again: Halloween. Thus I begin with the Halloween inspired posting again. I truly enjoy this time of year and horror/nostalgia gaming. To complement the Universal Pictures Frankenstein here is the immortal Bela Lugosi's Dracula. Or at least my interpretation of him. Re-watching the film (along with The Return of the Vampire and Abbott and Costello Meet Frankenstein) I tried to come up with a list of abilities seen or implied in the films. 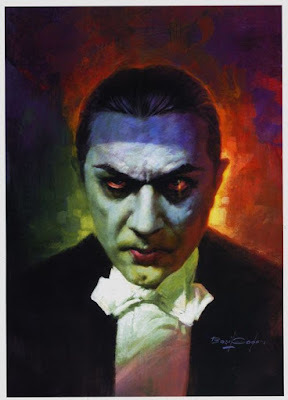 The Universal Dracula is not as powerful as the literary Dracula and later film versions, but he is the snazzy one and left a massive imprint on the world. Dracula is a vampire, an undead abomination posing as a human being that requires the blood of the living to continue to exist. Dracula can be quite charming but the facade will be quickly dropped when he is challenged or his plans are threatened. He is quite pale with a striking accent and has an affection for dressing in formal attire and opera cape. As an undead creature he is immune to damage from ordinary weapons. He only takes damage from fire, holy items, magic, sunlight, or a wooden stake to his heart (-6 to hit, see destruction below.) Dracula does not eat, drink, sleep, or breathe and his undead body does not tire and does not require rest after prolonged exercise. Dracula is stronger than an ordinary man, doing 1d4 points of damage when he strikes a foe. He also gains a natural +2 to armor class due to his condition and can see perfectly in the dark out to 60 feet. Dracula can also climb walls as per the Spider Climb spell. Dracula must drink the blood of the living and his bite drains 1d4 hit hit points of blood. He requires 4 hp of fresh blood nightly or he will lose one point of Constitution and appears to age 1d10 years on these nights. The Con loss and aging can be healed by consuming the normal nightly required 4 hps of blood and consuming an additonal 4 points per Constitution point lost. Dracula can also heal lost hit points this way. Once his nightly requirement of 4 hp is consumed he can continue to drink blood regaining 1 hp per 2 hp of blood consumed. If his Constitution was damaged he must heal the Con damage before healing hit point damge. Those drained to 0 hit points by the vampire will die unless medical treatment is received. Those who die rise as a vampire at sundown three days after. Dracula can change into the forms of a bat, mist, or wolf. The change takes one full round. (see below for stats.) He can also summon a swarm of rats, a swarm of bats, and individual or packs of dogs or wolves to do his bidding. He can only summon one type of animal at a time. The range of this summonng is 1000 yards and, if available, will arrive within 1d6 rounds or longer as DM decides. One of the vampire's most insidious powers of that of hypnotism. The effect is as if a Charm Person or Sleep spell had been cast and functions as such in all ways including duration. The victim does receive a Saving Throw to avoid the effect. The Save is at a 4 penalty if the victim has previously been drained of blood by Dracula. Dracula also has a number of weaknesses. He must rest on a bed of earth from his native soil. If he does not he takes one point of Constitution damage per night. This Constitution loss can be stopped when he rests again on the soil. The Con lost can be healed by extra consumption of blood as detailed above. The vampire is repulsed by the sight of holy items such as crosses and bibles. When presented with these Dracula cannot approach within 10' of the wielder of the object and contact with such an object does 1d6 damage. Exposure to direct sunlight also causes 1d6 damage as does total immersion in running water. Dracula cannot enter a private dwelling without an invitation from a person who lives or is staying at the dwelling. This invitaiton can be gained via hypnotism or other trickery. Even if invited when garlic is placed at a portal he must make a Saving Throw with a 4 penalty to enter. There are a few ways to destroy Dracula. Loss of all hit points via exposure to sunlight will burn him to ashes. A wooden stake to his heart will do 1d6 damage and paralyze him if he fails a Saving Throw. This automatically paralyzes him if he is resting in his coffin in the daytime. Once he is staked his head can be chopped off or the body burned for his destruction. If no action is taken after the stake has paralyzed him he enters a state resembling death and will remain so until the stake is removed. He will awaken with 1 hit point. Strength drops to 1. All others stay the same. All of Dracula's abilities and weaknesses remain except he cannot use hypnotism and his only attack is a 1d2 bite. Flight is gained at 180'/60'. Turning into a mist or fog he cannot use special abilities in this form. The only damage that affects this form is fire, holy, and sunlight. All others are ignored. 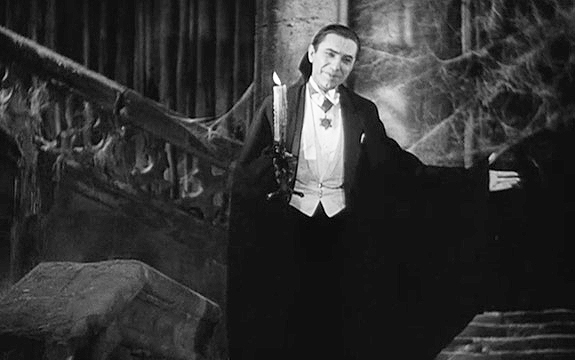 Dracula can move at a rate of 150'/50' in this form and can flow up walls, through keyholes, under doors, etc. All stats remain the same. All vampire abilities and weaknesses remain except he cannot use hypnotism. Move is 150'/50'. Bite is now 1d6 damage. Skilled killers, experts in poison and subtle murder. They can be professionals for hire, Imperial assassins, Yakuza hit-men, members of a ninja clan, etc. Assassins belong to the lowest social class. ⦁ Death Attack: Usable once per day per 2 levels. If an assassin studies a victim for 3 consecutive rounds and makes a sneak attack (as a Thief) that successfully deals damage, the sneak attack can potentially kill the target instantly. While studying a victim prior to an attack, the assassin can undertake other minor actions but must stay focused on the target. If the target knows the assassin is present, a Death Attack is not possible. The victim of such an attack must make a Saving Throw. If the Save fails, the victim dies instantly. If the Save succeeds, the attack is treated as a normal Thief Backstab attack for purposes of damage. After completing 3 rounds of study, the assassin must attack within the next 3 rounds to use this ability. If the assassin attacks and misses (and the target is not aware of the attack), or if the assassin does not launch the attack within 3 rounds of completing the study, 3 new rounds of study are required before another Death Attack attempt can be made. If a Death Attack is attempted and the victim succeeds at the Saving Throw (taking Backstab damage instead of dying) the assassin cannot make another attempt in this circumstance because the victim will almost certainly be aware of the assassin’s status as an enemy. ⦁ Poisons: Given an hour of brew time, and the proper ingredients the Assassin can create a virulent poisons. The poison can be ingested, contact, or injected as the Assassin desires. At first level the Assassin's poison does 1d6 hp damage and an extra 1d6 at levels 3, 9, 12, 15, and 18. The poison is insidious and slow; starting one hour after exposure it does 1d6 damage per hour until the available d6's of poison are used or the victim is dead. A Saving Throw is allowed during the initial 1d6 hp loss and if successful, all damage done is for half damage as the poison runs its course. 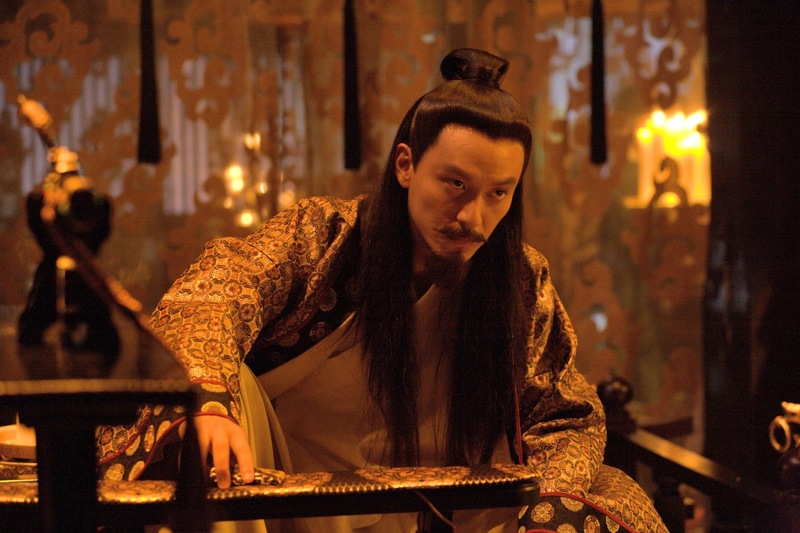 ⦁ The Assassin can also make an antidote for the poison. When given it stops all damage. ⦁ Both poison and antidote have a shelf life of a number of days equal to the Assassin's level. ⦁ Thief Abilities: Pick Locks, Move Silently, Climb Walls, Hide in Shadow. Trained dancers, singers, musicians, actors, etc. They can be found anywhere giving performances for money in the market to entertaining the nobility. Entertainers are adept at manipulating those around them and make excellent spies. They belong to the lower social class but they are valued for their skill and can elevate a patron's status. ⦁ Influence Reactions: When performing before an individual or group that is not attacking (and not intending to attack in a round or two), the Entertainer can try to alter the mood of the listeners. He can try to soften their mood or make it uglier. The method can be whatever is most suitable to the situation at the moment -- a fiery speech, a poem, a haunting lute melody, or a heroic song of heroes long gone. Everyone in the group listening must roll a Saving Throw (if the crowd is large, make Saving Throws for groups of people using average hit dice). The die roll is modified by -1 penalty for every three experience levels of the Entertainer (round fractions down). If the Saving Throw fails the group's reaction can be shifted one level toward either the friendly or hostile end of the scale, at the player's option. Those who make a successful Saving Throw have their reaction shifted one level toward the opposite end of the scale. ⦁ Inspire: The music, poetry, and stories of the Entertainer can also be inspirational, rallying friends and allies. If the exact nature of an impending threat is known, the Entertainer can heroically inspire his companions (immortalizing them in legend), granting a +1 bonus to attack rolls, or a +1 bonus to Saving Throws, or a +2 bonus to morale (particularly useful in large battles) to those involved in melee. The Entertainer must spend at least three full rounds singing or speaking before the battle begins. This affects those within a range of 10 feet per experience level of the Entertainer. The effect lasts 1d6 plus one round per level. Once the effect wears off it can't be renewed if the recipients are still in battle. However, troops who have withdrawn from combat can be inspired again by the Entertainer's words. ⦁ Languages; The Entertainer receives twice the number of beginning langages, both beginning and bonus. At third level the Entertainer has picked up a few tricks along the way and has a 50 percent chance to read and understand the basics of any normal writing or language (including simple codes, dead languages, treasure maps, and so on, but not magical writings)that he does not speak. This chance increases by 5 percent every even level. If he tries but fails to read a piece of writing, he must gain at least one experience level before trying to read it again. This is an important ability since the Entertainer has no ready access to Read Language spells. ⦁ Lore: Entertainers learn a little bit of everything in their studies and travels. They have a 50 percent chance at first level plus five percent at each even level after, to a maximum of 100 percent to know local legends, sites, famous or notorious individuals, local gossip, etc. They also use the same chance to identify the general purpose and function of any magical item. The Entertainer need not handle the item but must examine it closely taking 1d10 rounds. Even if successful, the exact function of the item is not revealed, only its general nature. ⦁ Thief Abilities: Hear Noise, Open Locks, and Pick Pockets as a thief of equivalent level. 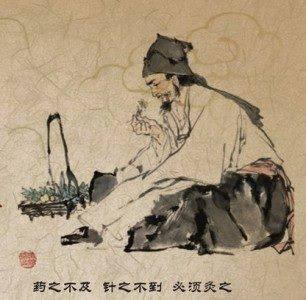 Those with a talent and knowledge for caring for the sick and making medicines, using acupuncture, etc. They are often trained physicians or priests, but this class could also represent wise men or women in the wild. They are usually of the common social class. ⦁ Diagnose: The Healer can make a Diagnose check with a chance for success of 60 percent at first level plus five percent at every even level. Success allows the Healer to diagnose the illness of a patient giving him information on proper treatment of the illness and on any further checks with that patient during the adventure. The DM can modify this with a penalty based on insidious or obscure conditions. Bonuses for a successful diagnosis are: +1 hp per Healing dice on the patient and a + 10 percent on Stabilization checks. ⦁ Healing: A Healer may heal 1d6 (one healing dice) of hit points lost in a single combat encounter, trap, disease, poison or other hit point damaging encounter once per day per level. Only one healing dice can be used on a single character's lost hit points in these encounters; you cannot use Healing dice on a the same set of lost hit points twice. You cannot attempt heal them again the next day; natural or magical healing must be used. For example, a first level Healer could heal one characters set of wounds from one combat encounter for once per day, recovering 1d6 hit points. At third level he would have three 1d6 healing dice per day. He could use them on three different people or the same person damaged in three different combat or damage encounters within the same 24 hours. Healing dice will work in combination with Poultices (see below), magical healing, and various Binding Wounds rules to heal a set of wounds from a combat or damage encounter. ⦁ Poultices: With a bit of preperation the Healer can prepare a few poultices or medicine to be appied to wounds to alleviate pain and help the wounded. Each applicaton to a set of wounds after a combat or other damage encounter will return 1d3 hit points to the patient. Only one poultice can be applied for effect on one person's set of wounds incurred in an encounter. He can make a number of poultices equal to half his level per day (round up.) Each poultice lasts for two days per Healer level. After that they are spoiled and useless. These work in addition to a Healer's Healing ability, magical healing, and various Binding Wounds rules. ⦁ Rapid Healing: A patient under a Healer's care heals twice the number of HP per day with natural healing. The Healer must help his patient with his needs and attend to the patient's wounds at least four times per day with bandage changes, cleaning the wound, applying medicine, etc. If he goes more than six hours without tending to his patient the patient only receives the normal amount of hit points gained that day via natural healing. This number of hit points is modified by the normal rules of complete rest vs strenuous movement, combat, etc. A patient under a Healer's care always recovers at least one hit point per day, strenuous activity or not. ⦁ Stabilization: A Healer can try to control bleeding, rub life into limbs, apply wine, breathe into their mouth, etc and stabilize any character that has reached 0 or fewer hits points and would otherwise be dead or dying. The Healer must reach the victim within a number of rounds equal to the Healer's level beginning on the round after the patient drops to 0 or below. Once the Healer has reached the patient he must then make a Stabilization check with the same percentage as a Diagnosis check with a -5 percent penalty for every hit point below 0. If he succeeds in this the character is stabilized and does not continue to lose hit points or die. If the victim is wounded again, another Stabilization can be made but with a -20 percent penalty in addition to normal bonuses and penalties, representing the shock of additional wounds to the body. Officials appointed by magistrates or other officials to investigate crimes. This class could also represent a spy or other unofficial snoop such as a bored yet curious noble. They tend to be of the higher social class if appointed. ⦁ Deduction: After reviewing clues, interviewing witnesses, visiting crime scenes, consulting official documents, etc the Investigator can make a Deduction check with a chance of 40 percent at first level plus five percent at every even level. If successful the Investigator may ask the DM a single yes or no question which the DM must answer honestly. The Investigator can do this once per adventure at 1st level and every fourth level after at 4, 8, 12 ,16, and 20. Therefore an 8th level Investigator may as the DM three questions per adventure. ⦁ Contacts: With a successful Charisma check the Investigator may ask one favor of a contact such as a coroner to view a body, a clerk to view official documents, a Magistrate to talk to a special prisoner, a Yakuza to set up a meeting with a crime lord, etc. The favor will be things not generaly available to the average citizen for a simple bribe. It is for more obscure and difficult to get information. The contact will not endanger himself or his employment and may negotiate a payment or favor in return if the request by the Investigator is difficult or unpleasant. The Investigator receives a bonus to the Charisma check at higher levels: 3, 6, 9, 12, 16, and 20. ⦁ Langages: The Investigator is a studious man who encounters many people from different places. To effectively do his job he must commnicate with them and thus tends to be a natural at picking up new language skills. While not as skilled at languages as the Entertainer he begins with one extra language plus any bonus languages. He can learn a new language at levels 4, 8, 12, 16, and 20. A learned man the Investigator has a natural affinity with patterns and clues which gives him a 50 percent chance to read and understand the basics of any normal writing or language (including simple codes, dead languages, treasure maps, and so on, but not magical writings) that he does not speak. This chance increases by 5 percent every even level. If he tries but fails to read a piece of writing, he must gain at least one experience level before trying to read it again. This is an important ability since the Investigator has no ready access to Read Language spells. ⦁ Observation: The Investigator has a keen eye for details in the world around him. When actively looking for clues or other hidden objects he has a 1-2 on a 1d6 of finding them. These could be hard to find clues such as hidden bloodstains, faint footprints, hidden doors, etc. The DM can modify this for difficulty. The Investigator will always have an advantage in this over other classes or creatures that do not have this ability. Trained as spies, assassins, and saboteurs. They most often belong to a clan which works for a daiymo or powerful noble. A ninja without a clan is often an outcast marked for death. Armor: Can wear up to chainmail but must be in leather or equivalent to use Thief abiities. ⦁ Thief Skills: Find/Remove Traps, Move Silently, Hide in Shadows, Climb Walls, Hear Noise, and Backstab. Gains the Escape ability with a chance equal to a Thief's Pick Pockets roll. ⦁ Acrobat: +1 to Dex rolls for acrobatic feats such as tightrope walking, tumbling, pole-vaulting, etc. This bonus increased by +1 at levels 3, 5, 8 12, 15, and 20. ⦁ Controlled Fall: No damage for falls of 10 feet or less. He can make a Saving to reduce the fall damage from greater heights, varying by level. If he makes the Save he takes no damage, if he fails the Save he takes half damage, if he fails by more than five he takes full damage. The distance fallen is 15' at second level plus 5 ' per level after to a maximum of 100. ⦁ Instant Stand: If prone the Ninja, on his turn in iniative, can stand up with no penalty or loss of action. ⦁ Unarmed Damage: The Ninja has some training in unarmed combat. At level 1 unarmed damage is 1d3. At level 5 it increases to 1d4, at level 12 it increases to 1d6. ⦁ Shuriken/spike Throw: Trained in the art of throwing these small weapons. Their rate of fire increase by one at levels 1, 6, and 12. The Ninja class comes with a few penalties as well. 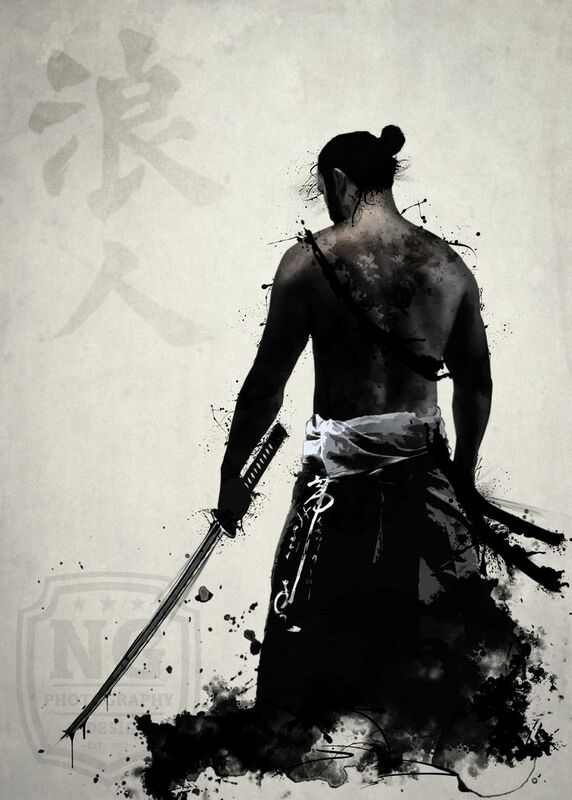 ⦁ Pawn of the Clan: Ninjas belong to a clan and are subject to the commands of the clan leaders. 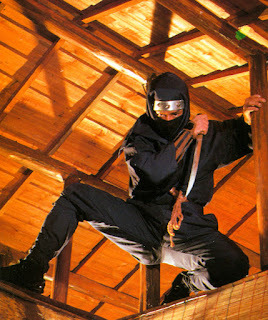 IF the ninja does not belong to a clan he is likely a hunted renegade and must be on his guard for assassins. A ninja without a clan does not have as many resources: monetarily, personnel, or equipment. ⦁ Mistrusted: If a ninja is discovered or is suspected to be a ninja by non-clan members or allies he suffers a -4 to his charisma score and associated rolls. Members of a Tong, the Yakuza, gamblers, an independent collector or other people's things, etc. They are of the lowest social class. ⦁ Thief Skills: Open Lock, Find/Remove Traps, Pick Pocket, Move Silently, Hide in Shadows, Climb Walls, Hear Noise, and Backstab. ⦁ Fast Talk: With a bit of conversation, and a good bit of lying and trickery, the Thief is often capable of befriending, bribing, or conning an individual to his way of thinking. After 2d6 minutes of cajoling, flattering, drinking, etc the victim of the Fast Talk must make a Saving Throw. The victim's Saving Throw has a cumulative -1 penalty roll for the Thief's level at 1st and every fourth level after at 4, 8, 12 ,16, and 20. If the Save is failed the individual will give up some bit of information, do a small favor, or otherwise not hinder the Thief as long as the Thief appears to be friendly. This is not a magical effect: if the individual finds out the Thief is lying to him or some other situation arises to change his view of the Thief he may act normally. ⦁ Gambling: A Thief often haunts shady establishments and is not adverse to supplementing his living with cards, dice, his wits and nimble fingers. At 1st level and at 3rd, 6th, 9th, and 12th the Thief gains a cumulative +1 bonus to his gambling checks. 101st post. How about that. Despite my love over the decades for BECMI D&D and the more recent love of Swords & Wizardry and Labyrinth Lord I like more complicated or 'meatier' classes. I've posted enough on here to show that. Usually derivatives of my own classes adjusted for genre, setting, etc with more regard for fun over 'balance.' Here we go with my iteration of Oriental Classes for OSR games. The names given to the character classes are based on what popular cultural mold they fit into (Samurai) and as a means to describe in a package what they focus on in combat (Archer.) The bushi or military social class (samurai) were talented with horse, bow, and melee weapons, thus a samurai of the bushi social class may actually be of the Archer, Duelist, or Raider character classes, not just the Samurai character class. This defines the character's individual skills and is not an indicator of social class although some character classes such as Barbarian or Sumo do not fit well into the higher social classes. Warriors unusually skilled with bows. 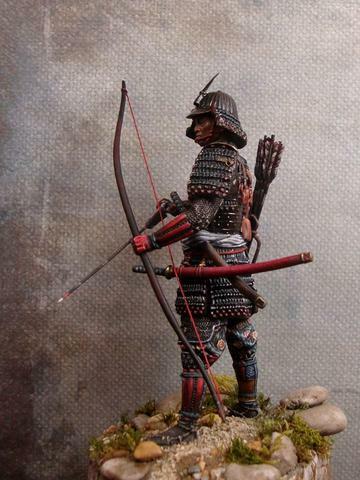 They can be of any class: samurai, bandits, heroic farmers, etc. ⦁ Bow Expertise: +1 to hit with a bow. ⦁ Sure Shot: No penalty for unstable platform such as a running horse, chariot, rolling ship deck, etc. ⦁ Long Shot: Range increment's for bows increases by 50 percent. ⦁ Level 3: Dead Shot: After aiming for one full round the archer receives a +4 bonus to his bowshot the next round. This bonus only applies to the first shot of a round. ⦁ Level 9: Rapid Shot: An third bow attack is gained. ⦁ Level 12: : Trick Shot: Called shot penalties reduced by half. 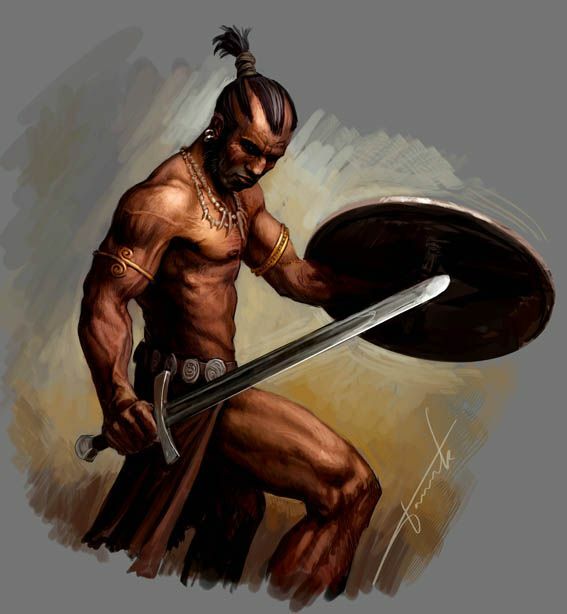 Warriors from the southern jungle kingdoms, isolated mountain warriors, and other strong and fierce fighters outside the normal social order. Armor: Chain and shield. May wear heavier but lose special abilities while in the heavier armor. ⦁ Alert: Only surprised on a 1 on a 1d6. 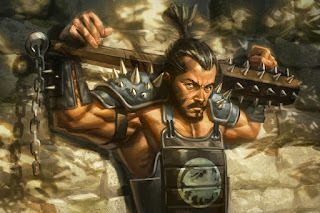 ⦁ Battle Fury: Once per day per level the Barbarian can make a single brutal attack on his opponent, sacrificing accuracy and finesse for sheer damage. The attack is at a -2 to the attack roll but does x2 damage if successful, x3 if a natural 20 is rolled. ⦁ Climb: As a Thief of equal level. ⦁ Survival: The ability to live off of the land and survive, this check is rolled in addition to normal foraging rolls. The DM may modify this check for plentiful or exceptionally harsh terrain. This also includes the ability to track with penalties and bonuses for mud, snow, dry ground, etc at the discretion of the DM. The chance for success is 60 percent at first level plus five percent at every even level. Fierce and dangerous warriors which rely on brute strength and strong armor to inflict horrific wounds and death on their enemies. Infantrymen, muscle for hire, etc. Weapons: Any but greatly prefer melee weapons. ⦁ Brawn: A Brute character gains +2 to all melee and unarmed damage rolls (in addition to their normal Strength bonus). They know where to hurt people and hit like a freight train. ⦁ Crusher: Once per day per level the Brute can summon his inner reserves of anger and rage to deliver a brutal strike. With a -2 to the attack roll but doing x2 damage (rolled and modifiers both.) If a natural 20 is rolled the modifier is x3. If he takes more than one attack per round, for example wielding two weapons, he can take both as a Crusher attack as long as all penalties are applied and he hasn't used all his daily Crusher attacks. ⦁ Destroyer: At third level the Brute can swing wildly attacking twice per round with a melee weapon with a -2 penalty to each attack. This penalty is in addition to any other attack combinations such as two-weapons and follow through if multi-classed. ⦁ Follow Through: At level 3 the Brute can make an additional attack if the first attack is a hit. The extra attack can be against the same opponent or against another foe if the new target is within five feet of the Brute. He can attempt a third attack at level 12 and a fourth at level 20. If an attack misses the follow through ends, any remaining attacks are lost. ⦁ Intimidation: Once per day per level the Brute can intimidate creatures with a total HD equal to his level. Thus a fifth level brute can intimidate up to five HD of creatures. Lowest level HD creatures are affected first. The creatures must be able to see the Brute's display of intimidation to be affected. The creatures are allowed a Saving Throw to avoid this effect. Those that fail suffer a –2 to all attacks on the Brute. Most will flee; only the most determined will stay and fight. ⦁ Iron Constitution: Brutes make saving throws against disease and poison with a +4 bonus. The backbone of armies who are not of the nobility/officer social class. They are peasant foot-soldiers skilled at fighting with infantry weapon and armor. ⦁ Weapon Focus: At levels 1, 5, 10, 15, and 20 the Common Warrior may choose a melee weapon type (sword, two-handed sword, dagger, spear, etc) and does damage as if the weapon is one dice code higher. Example: a short sword does 1d8, a sword does 1d10, etc. ⦁ +1 to attack with focus weapons. ⦁ Follow Through: At level 3 the Common Warrior can make an additional attack if the first attack is a hit. The extra attack can be against the same opponent or against another foe if the new target is within five feet of the Common Warrior. He can attempt a third attack at level 12 and a fourth at level 20. If an attack misses follow through ends, any remaining attacks are lost. ⦁ Pick Pockets: The Common Warrior is of the lower class and often has to supplement his meager income by pilfering money or objects of use. He can Pick Pockets as a Thief of equal level. Those devoted completely to mastery of a fighting style and travelling on the path of mastery of their chosen weapon's art. Duelists run the gamut of social classes; many famous samurai are Duelists. ⦁ AC Bonus: +1 at levels 1, 4, 8, 12, 16, and 20. This bonus only applies if his focused weapon type is in hand or in easy reach to Fast Draw. ⦁ Follow Through: At level 3 the Duelist can make an additional attack if the first attack is a hit. The extra attack can be against the same opponent or against another foe if the new target is within five feet of the Duelist. He can attempt a third attack at level 12 and a fourth at level 20. If an attack misses the follow through ends, any remaining attacks are lost. ⦁ Quick with a Blade: The Duelist is a Dexterity based fighter. He may use his Dexterity bonus instead of his Strength bonus for melee attacks. ⦁ Fast Draw: +1 to Fast Draw Initiative (see end of post) at levels 1, 3, 6, 9, and 12. ⦁ Spirit Strike: The Duelist can strike creatures that would only be normally hit with silver or magical weapons. At level one he can hit those that require silver. At level three +1 weapons. At level five +2 weapons, at level eight +3 weapons, at level twelve +4 weapons, at level sixteen +5 weapons. Warriors, monks, peasants, etc devoted to the development of unarmed fighting styles. Martial Artists can be of any social class. ⦁ Martial Arts: The Martial Artist is trained in the art of melee/unarmed combat. He receives a +1 to attack rolls for unarmed attack. His damage and AC also increases at higher levels. 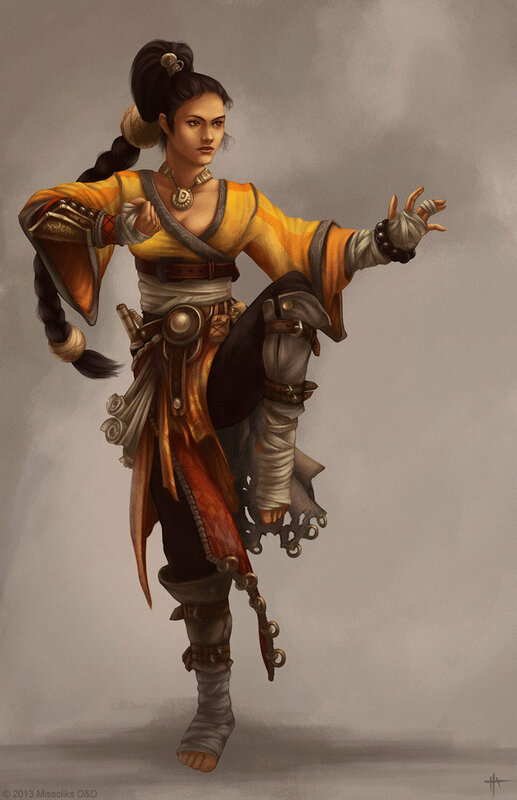 ⦁ Mutiple Attacks: The Martial Artist can attack twice per round unarmed. He gains an extra attack at levels 5, 12, and 20. ⦁ Power Attack Once per day per level the Martial Artist can summon his inner reserves of power to deliver a brutal strike such as a devestating uppercut, a mighty chop, round house kick etc. This attack is rolled with a -2 to the attack roll but does x2 damage (rolled and modifiers both.) If a natural 20 is rolled the modifier is x3. If the Martial Artist is of sufficient level to gain multiple attacks this attack can be used with other melee/unarmed attacks in the round. It does not have to be the only attack in the round. ⦁ Instant Stand: If prone the Martial Artist, on his turn in iniative, can stand up with no penalty or loss of action. ⦁ Second Wind: If the Martial Artist takes a full round to rest he can regain 1d4 hit points. He must do no other action in this round but rest. He cannot defend himself. His AC is 10 + leather armor if worn; he recieves no Dex or MA AC bonus. He can use this ability once per day and gains an extra daily usage at levels 5, 10, 15, and 20. ⦁ Stick and Move: By sacrificing half of his normal encounter movement a Pugilist can stick and move with an opponent who tries a fighting withdrawal. As long as the Pugiist has so far only moved his half movement in the round he will stay withing 5' of with his opponent. ⦁ Third Level: Deflect Missiles: To use this ability the character must be level 3 and aware of the incoming missile attack (and they must be physical missiles not magical force, fire breath, etc.) The Martial Artist can sacrifice one attack to make a Saving Throw to deflect the missile. If the Save is successful by five or more on the roll the missile is caught. This ability will only work on melee size weapons (daggers, knives, shuriken, spears, arrows, bolts, etc.) If the Save is attempted on a large missile it must be made by five or more on the roll to deflect and cannot catch the large missile. ⦁ Death Touch: The ultimate techniques of the Martial Artist. The use of the ability requires a successful attack by the Martial Artist. There are three levels of the Death Touch. Each can only be used once per day. At level 6 the character learns how to stun with his attack, treat as a Power Word Stun. At level 9 he learns to blind as a Power Word Blind spell. Finally at level 12 he learns to kill as a Power Word Kill spell. Sailors, sea-wolves, and smugglers. They run the entire scale of social classes. Weapons: Any but prefer short and stabbing weapons for ship fighting. Armor: Leather or equivalent to use thief abilities and shield . ⦁ Brawler: They receive a +1 to hit on melee and unarmed attacks. ⦁ Sailing (includes navigating and ship repair): Intelligence check. The Pirate receives a +1 to this check and an additional +1 bonus at every fourth level. This includes the art of steering and keeping the ship running as well as navigating or finding ones position using an Intelligence check with the Sailing bonus included. Bonuses may be given for good charts, maps, etc. When used to repair a successful roll allows x2 the number of ship points to be repaired. ⦁ Thief Abilities: A pillager the Pirate must be able to sneak aboard ships or camps on the shore or docks. He can Move Silently and Backstab as a Thief of equal level. He can Climb Walls but not as well as a Thief. At first level they climb at 50 percent plus five percent per even level. ⦁ Gambling: Life aboard ship can be boring and the Pirates find ways to pass the time. Oneof their favorites is gambling and are notorious for being skilled at most forms of games and at the art of cheating. At 1st level and at 3rd, 6th, 9th, and 12th the Pirate gains a cumulative +1 bonus to his gambling checks. Those who are extremely skilled in the saddle. Excellent riders and horse-fighters. 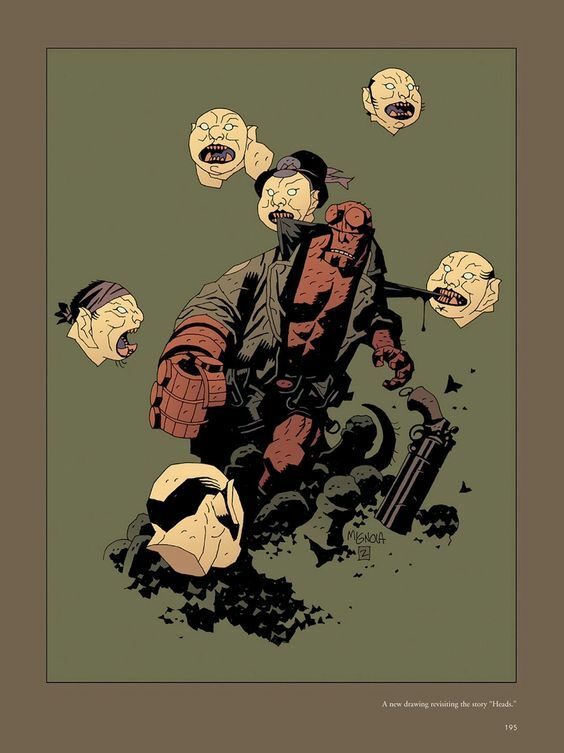 Includes bandits, samurai, etc. Weapons: Any but greatly prefer one-handed melee for riding. Armor: Any but must be in chain or lighter to use surprise bonus. ⦁ While mounted the Raider gains a +1 to AC and can use his Dex bonus increase his mount's AC. ⦁ With a successful check, the Raider can drop along the side of his mount for cover, gaining a +4 cover bonus to his AC. This is considered pretty dishonorable by quite a few. ⦁ With a successful check the Raider can fall from a mount and take half damage (see Riding in Rules Clarifications: Miscellaneous.) This does not apply to flying mounts. ⦁ With a successful check the Raider can coax the mount to leap obstacles it would normally balk at jumping. ⦁ Stealthy: The Raider is adept at sneaking up on enemy camps. He gains a +1 to surprise foes. ⦁ Survival: Just like the Scout the Raider is adept as living in the harsh wilderness. This check is rolled in addition to normal foraging rolls. The DM may modify this check for plentiful or exceptionally harsh terrain. This also includes the ability to track with penalties and bonuses for mud, snow, dry ground, etc at the discretion of the DM. Less skilled than the Scout, the chance for success is 40 percent at first level plus five percent at every even level. Upper class warriors trained in the art of combat. Samurai, Chinese knights, etc. They generally are better equipped and trained at personal combat than common soldiers. Armor: Any samurai armor. 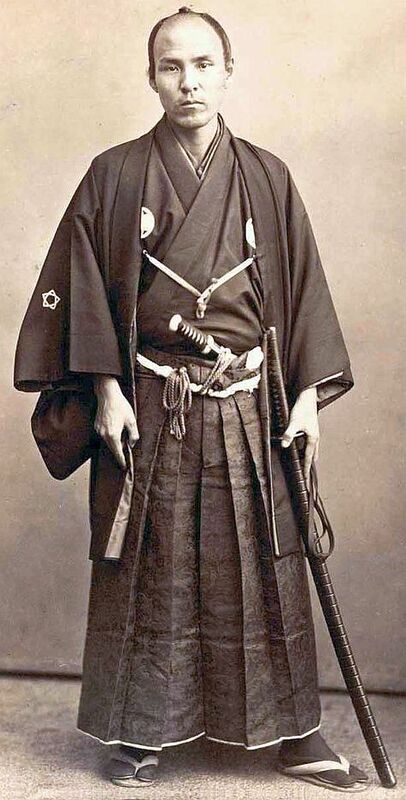 A Samurai will go without armor rather than wear equipment he believes is below his status. Weapons: Preference for samurai weapons. See below. 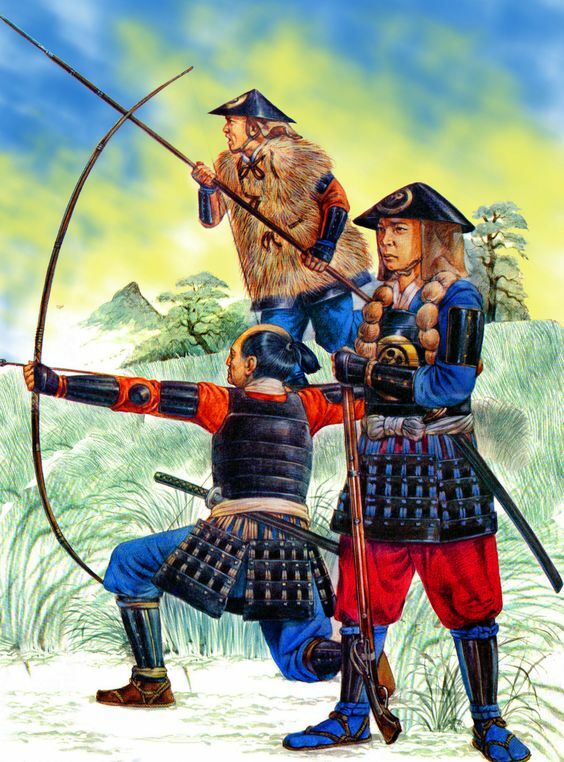 ⦁ Favored Weapons: At levels 1, 5, 10, 15, and 20 the Samurai may choose a melee weapon type but it is limited to katana (sword), naginata (polearm), tetsubo (two-handed club), yari (spear), and wakizashi (shortsword) in no particular order. ⦁ +1 to attack with Favored weapons. ⦁ AC Bonus: +1. The Samurai receives superior training in the art of dueling. This bonus only applies if one of his favored weapon types is in hand or in easy reach to Fast Draw. ⦁ Follow Through: At level 3 the Samurai can make an additional attack if the first attack is a hit. The extra attack can be against the same opponent or against another foe if the new target is within five feet of the Samurai . He can attempt a third attack at level 12 and a fourth at level 20. If an attack misses follow through ends, any remaining attacks are lost. ⦁ Fast Draw: +1 to Fast Draw Initiative (see end of post) at levels 1, 4, 8, and 12. This class represents those with great skill in hunting, tracking, and wilderness reconnaissance. 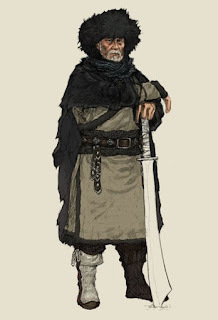 Most often peasant hunters or guides and lower social class soldiers. They will often serve as messengers. Armor: Chain or lighter to gain surprise bonus and shield. ⦁ +1 to AC. This applies in chain armor or lighter. ⦁ Alert: Always vigilant he is difficult to get the drop on and gains a -1 to be surprised. ⦁ Backstab: Scouts are capable hunters and once a quarry is found they are adept at attacking from surprise to kill the prey. +4 to attack. x2 damage. x3 damage at levels 5-8. x4 damage at 9th level. This also includes ranged attacks until the target(s) are aware they are being fired upon. ⦁ Climber: As a Thief of equal level. If in chain armor the chance is at -20 percent. ⦁ Runner: Scout's base movement is 135'/45'. ⦁ Survival: The Scout’s ability to live off of the land and survive, this check is rolled in addition to normal foraging rolls. The DM may modify this check for plentiful or exceptionally harsh terrain. This also includes the ability to track with penalties and bonuses for mud, snow, dry ground, etc at the discretion of the DM. The chance for success is 60 percent at first level plus five percent at every even level. Sumo wrestlers (rikishi) are trained athletes who are professionals at using their bulk and strength to man-handle opponents. Sumo can be professional athletes competing for money and favor, out of luck and working as a Yakuza thug, or any other place requiring someone big and good at moving people. Weapons: Any except bows. Greatly prefer two-handed weapns such as tetsubo. ⦁ Wrestling: (see end of post) The Sumo's life revolves around shoving, pushing, and throwing enemies in professional matches and in personal combat. He gains a bonus to wrestling rolls/shoving/pulling attacks, increased hold/lock damage, increase in throwing damage, and bonuses to his AC. ⦁ The wrestling bonus is added onto the distance an opponent is thrown on throws. 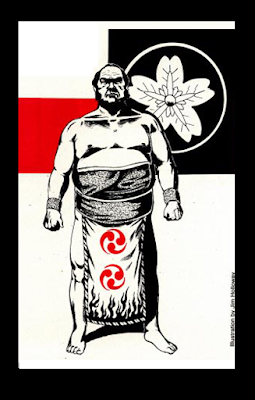 ⦁ Power Slam: Once per day per level the Sumo can turn a successful Wrestling attack into a brutal slam into the ground at his feet. The attack is at a -2 to the Wrestling roll but does x2 throwing damage if successful, x3 if a natural 20 is rolled. The victim is prone after the successful attack. ⦁ Stunning Slap: An open handed slap which can stagger an opponent. It is the only attack allowed in the round. The slap does the same damage as a hold and the opponent must make a Saving Throw with a penalty equal to the Sumo's wrestling bonus, or be stunned for 1d4 rounds. While affected the opponent has a four penalty to all wrestling rolls, attacks, Saving Throws, etc. Any combatant can draw and use a weapon in the same round, but doing so incurs a penalty of -3 to the initiative roll and a -2 to the attack roll. Those with the Fast Draw ability (Duelist and Samurai) can draw with no penalty to the attack roll. They add their Fast Draw bonus to help compesate for the -3 initiative penalty. Eventually the bonus to FD for the Duelist and Samurai will rise high enough to let them outdraw even ready foes as their mastery of this technique increases. There are two types of wrestling attacks: voluntary and involuntary. If voluntary both sides want to grapple and the combatants close together, each rolling 2d6 plus their attack bonus plus either their strength or dexterity bonus. The highest total wins and can hold the victim or throw him. If there is a tie no one has the advantage this round and it carries to the next round. Damage is 1d2+ strength bonus or the winner can choose to do no damage and just place the loser in a restraining hold. The winner of the first round places his foe in a hold and can do damage if he wishes. The next round has a +4 bonus to his wrestling roll and can force the victim to the ground while maintaining the hold and doing damage if he wishes. The winner continues to receive the +4 bonus until the one being held wins a round and breaks free. If he does break free wrestling continues with normal wrestling rolls if the wrestler's wish to continue. A held wrestler can attempt to punch or attack the other wrestler with a small melee weapon such as a dagger but receives a -4 to his attack roll. This also detracts from his wrestling and gives his foe an additonal +4 bonus on the wrestling roll for a total of +8. Up to four combatants can wrestle a single opponent of the same size in a given round. Each extra opponent adds a +1 bonus to their side's wrestling roll (use that side's best character for the wrestling roll) for a maximum bonus of +3. A held opponent can be attacked by a third party not involved in the grappling. The attacker or attackers gain a +4 bonus to hit against the held foe as long as he is grappeld.The wrestler holding cannot do any other attack except try to maintain the hold with wrestling rolls. 1d3 +strength bonus into the ground or object. The thrown foe lands 1d6 plus the thrower's strength bonus in feet away from the winning wrestler in any direction he chooses. If thrown far enough to go over a cliff or other drop a Saving Throw with a dexerity bonus is allowed to grab the edge and stop the fall. When one side aims to wrestle and the other does not the grappler must make a normal attack roll with all normal bonuses and penalties. If successful he has grabbed onto the foe and can either hold or throw his victim as above. The victim of the grapple can attempt a melee or unarmed attack with penalties or try to mutually wrestle with the attacker in the next round. Creatures able to fly may attempt to carry off their opponents (even if the flying creature is the defender) unless the attacker has stated that they are grappling the creatures wing. 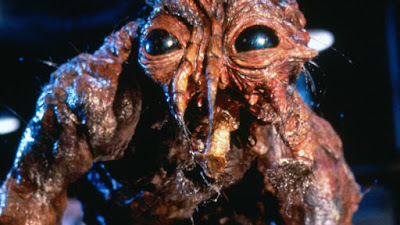 If no wings are used in flight the creature may fly as usual if it is strong enough to lift the attacker. Unintelligent monsters will always choose to use their normal attacks instead of wrestling, unless under control. Several types of creatures are immune to some or all of the effects of wrestling: Noncorporeal undead (ghosts, spectre, etc. ), oozes, jellies, slimes, and similar creatures cannot be wrestled. Ethereal or elemental creatures can be wrestled only by opponents in the same form. Special abilities (energy drain, turn to stone, etc.) function normally during wrestling if the monster wishes them to. For example, a character wrestling a cockatrice must make a saving throw vs. turn to stone every round while in contact with the monster.